As the end of the year nears, it’s time to start looking ahead to 2019. We have compiled a list of predictions from experts around the industry on what they see as the biggest changes to expect next year. As technology and security evolve, the threat from cyber criminals heightens as well. Being aware and knowledgeable of the potential threats this upcoming year will help you make the right decisions to stay secure. Overall, keeping up with cyber hygiene is going to be an important factor in 2019. Educating staff on the necessity of cyber hygiene will go hand-in-hand with continuous monitoring. You can read our blog here to learn more about good cyber hygiene habits. Managing security is an ongoing task but one that is absolutely necessary. These three potential threats for 2019 are worth your attention. TechRadar tells us that cloud insecurity grew in 2018 and will only continue to grow in 2019. Despite breaches and insecurity being publically known and reported, lack of housekeeping means this continues to be a problem. Many companies still only require single-factor passwords as authentication, but it seems that there will be a move towards standardized multi-factor authentication in the upcoming year. It’s fairly inexpensive and easy for organizations to utilize multi-factor authentication, and as you’ll see below, because the public may influence data protection policies, there is a good chance this will become the new norm. IoT will continue to present challenges and potential security breaches. IoT is increasingly used by organizations without a ton of thought given to the potential security threats it presents. 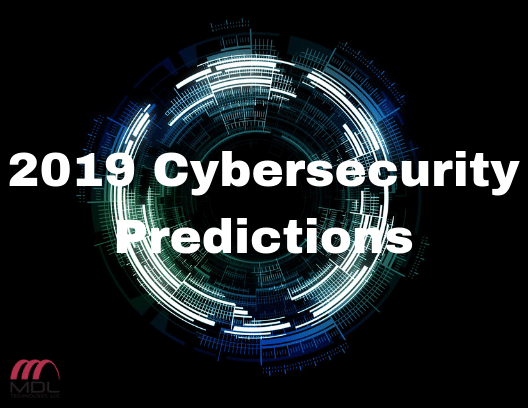 CSO Online has predictions that more broadly involve individual and national security, like establishing cyber warfare rules, more nation-state attacks on individuals and the public driving data protection policies. Of course, predictions are just that — educated guesses on what the new year holds. But one thing you can be sure of is a heightened level of sophistication when it comes to criminal activity, and consequently the need for awareness and protection.